Charlemagne, son of Pepin III and grandson of Charles Martel, is believed to have been born on April 2, 742. The first emperor in the West since Romulus Augustulus in 476, Charlemagne’s influence did much to shape the future of medieval Europe. 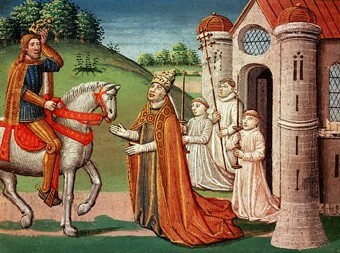 When Pepin died in 768, his kingdom was split between Charlemagne and his brother Carloman, who died three years later. Charlemagne also took over his dead sibling’s inheritance- central France and southwest Germany. By 774, he invaded Italy twice with the backing of the Pope, and added King of the Lombards to his resume. Charlemagne turned his attention north and conquered Bavaria without much of a struggle, but the Germanic Saxon tribesman, who had been attacking the Franks for years, weren’t going to be cowed so easily. Being a pious Christian, Charlemagne was horrified at the Pagan practices of the Saxons, so he waged war against them, destroyed their sacred groves, and killed them by the thousands when they refused to convert. In one day alone, 4,500 were executed for refusing to be baptized. For some strange reason, it took over thirty years to subdue the Saxons, and they never really took to the Franks. Go figure. Next was expelling the Muslims from northern Spain. This, however, was a no-go. His forces managed to take Pamplona, but beyond that it was an exercise in frustration. No humiliating defeat, but no huge victory like he was used to either. For all his religious zealotry, Charlemagne was an effective diplomat and administrator over the vast territory he ruled. Though somewhat primitive by standards of what came before – and after – Charlemagne led the revival of the arts and intellectual pursuits, and his reign has come to be known as the Carolingian Renaissance. His son Louis the Pious inherited his crown upon his death in 814, but the empire did not long outlive Charlemagne. By the late 800s, it was fragmented and dying. But Charlemagne himself had become a mythical figure, the Alexander the Great of Europe, endowed with god-like qualities who performed super-human feats. He was even elevated to sainthood for awhile although the Catholic Church today does not recognize him as such. Charlemagne had at least 18 kids who had drastically better life expectancies than other children of that period, and who married, and intermarried, into noble houses. So it is pretty safe to say anyone of royal stock in Europe can claim Charlemagne as an ancestor.